Weird... I don't have "Argus 1" in mine, or at least I didn't see it when I was on the PTR, haven't looked since it went live. But that confirms all 3 zones are in the single file spread out, which means extra work / time to make it work. 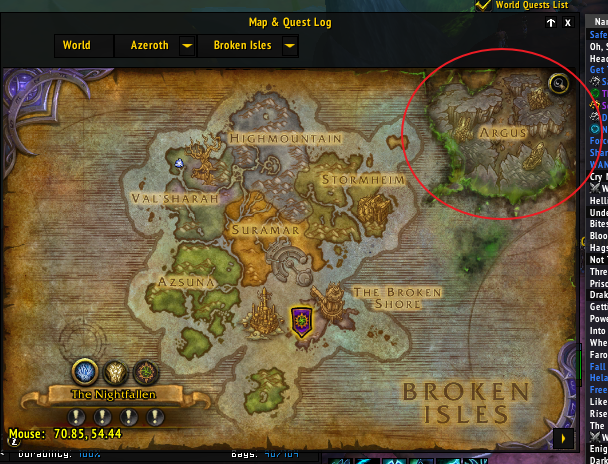 And doesn't solve the calculations failing and putting Macree just outside of Ashenvale, and Anton Wastes to the south west of Suramar while Krokuun is smack dab in the middle of the Argus world map. The only way I was able to find where the zones ended up, was by clicking on the raid and dungeons from within guide and seeing where it put me lol. 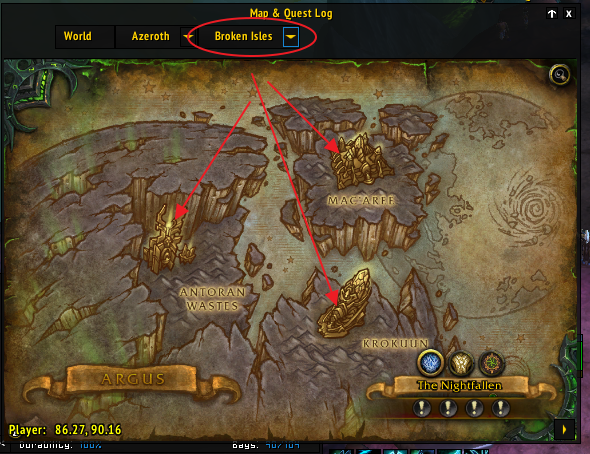 Argus zones are assigned to Broken Isles then it has some sort of page in which we choose Argus sub zone (those new 3 zones) and after that it goes to selected new Argus zone. Maybe this helps to position them. Last edited by ircdirk : 08-30-17 at 01:54 PM. Looks like someone beat me to it regarding the PlaySound issue. Which db2 table contains parent zone of overlays? I hopped out of game to let my addons update (including carb), and when I came back Carbonite was back to not working. Like, it says its loaded but there's no map/questing thing going on. I finally managed to turn off every addon but Carb, but still carb doesn't actually load. Any ideas? Edit: I went back to release but unfortunately that's back to the chat spamming we had. Edit 2: Found the right release. Phew. Its the last one from the 30th according to the twitch client. Ends in ccc-alpha doesn't have argus but has map/quest and no chat spam. Last edited by Tinibree : 08-30-17 at 08:16 PM. Questing on argus is not working, because the mapping is different and Rythal is working to fix that. If you zone back to Dalaran, you will see it working just fine, for all the other broken shore stuff. Get the latest from curse, and you should be good, everywhere but argus. I would like to apologize for my angry post that started this thread. I was frustrated from my own attempts at trying to get Carbonite working. I'm glad to see that headway is being made in fixing things up, and at least shutting down the chat spam from the addon while stuff gets figured out. I've used Carbonite for years, starting back when it was under other authors, but after it stopped being a paid addon. I've been making do with the Blizzard defaults for the map and quest log, but it just doesn't feel right doing so. I'm picking up the new alpha version shortly to get back to my usual UI layout. The latest alpha release on curse / github should work, it has everything working except the minimap tiles while I try to figure out how to handle that. Usage: RegisterEvent("eventname", "methodname"): 'methodname' - method 'CHAT_MSG_BG_SYSTEM_NEUTRAL' not found on self. (*temporary) = "Usage: RegisterEvent("eventname", "methodname"): 'methodname' - method 'CHAT_MSG_BG_SYSTEM_NEUTRAL' not found on self. Last edited by dvantassel11 : 08-30-17 at 09:18 PM. hay, I am just wondering if something was done to the quest bits in the alpha release, I loaded that in and now all of a sudden its not even showing up in my addons list in game. if there is a fix for this please let me know I like having my quests showing when I'm leveling lower level characters while the addon hell sorts it self out! Whatever you did fixed my issue, thanks Rhythal/other devs! The new version is working nicely, until I ask it to display ore nodes. Then, it starts dumping what appears to be a table to chat. EDIT: Asking the map to show herbs also causes a stack of numbers to start clogging the chat log. Something about Show Herbs and Show Mining Locations breaks it. Last edited by KrysEmlyn : 08-30-17 at 11:06 PM. Node data dumps into chat is fixed now. Thank you for fixing that. I'm downloading the new update shortly. Somehow, Ironforge missed getting a minimap image. All I have is the main map and red dots when moving. Missed mapid here?